Jonathan Kim’s analysis shows that although not as heavily publicized [as neurologic issues], long-term adverse cardiovascular outcomes have been demonstrated among retired, professional American-Style Football participants. 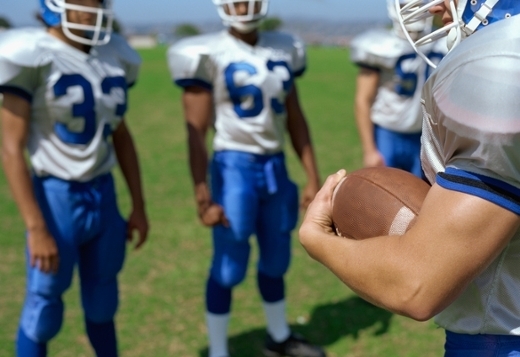 With the start of the American football season fast approaching, the health and wellness of players is top of mind. While most of the focus is on head and orthopedic injuries, heart health is also an important concern for these athletes. Emory Heart & Vascular Center sports cardiologist and researcher Jonathan Kim, MD, is the author of an online American College of Cardiology (ACC) expert analysis of the heart and vascular health of American football players. Kim, an assistant professor of medicine (cardiology) in the Emory University School of Medicine, launched a sports cardiology clinic at Emory Saint Joseph’s Hospital in 2014, evaluating and treating cardiovascular conditions specific to athletes of all ages and levels. In the ACC article, entitled “Cardiovascular Issues in Elite American-Style Football Participants,” Kim examines key research findings over the last two decades related to cardiovascular outcomes and risk factors among these top athletes. His analysis offered clinical perspectives and recommendations based on the existing data, as well as potential areas of future research. Although not as heavily publicized [as neurologic issues], long-term adverse cardiovascular outcomes have been demonstrated among retired, professional ASF participants. To date, the compilation of evidence suggests elite-level ASF participants are at higher risk for the development of early hypertension. This risk may be greater among linemen. Efforts aimed at identifying players with increased blood pressure and ensuring close monitoring of those athletes, as well as players deemed at high risk, should be considered. Practitioners and athletic trainers involved in the care of ASF athletes should be aware of pre-hypertensive blood pressures measured during pre-season ASF physical assessments, and consider developing procedures for blood pressure monitoring and follow-up throughout the season. Management strategies may be best focused on preventive measures such as limitations in sodium intake, minimization of non-steroidal anti-inflammatory (NSAID) medication use, focused overall dietary assessments, and perhaps alterations in training regimens with the inclusion of more aerobic-based exercise. Kim emphasizes the need for more research in larger cohorts of football players (including high school players) to confirm current findings and learn more about the causes and exact timeline for these changes. He has conducted his own published research among ASF participants cited within his analysis, including a 2015 study that found after completing one full season of college football, players demonstrate relatively stiffer arteries, a precursor to hypertension, compared to other non-athletic college students. “Future studies will help us learn more about the causes of these observed changes - possibly diet, undiagnosed sleep apnea, use of non-steroidal anti-inflammatories, and intense isometric physiology are all potential mechanisms,” he says.